We’ve designed a Live Sincerely t-shirt that is available in two different styles: unisex/kids and ladies v-neck. Each style is available in dark gray with yellow type or in yellow with dark gray type. Orders must be placed separately for each style of shirt. Note that there is a $5 shipping charge per order (not per shirt). So get with friends and family and order together to save a few bucks! If you want some unisex and some ladies, you’ll have to pay the $5 shipping charge on both orders. The order process closes on March 1st, so get your orders in before then! All the shirts sold will then be printed and shipped, so no matter when you place your order, you’ll receive your shirt(s) around the middle of March. The Unisex/Kids shirt is a classic 100% cotton t-shirt style. We did get to see a sample in person, and in trying it on we found it flattering on both men and women. The Kids sizes are in the same drop-down menu as the unisex, beginning with the letter Y. The Ladies shirt has a v-neck and is a tri-blend fabric. It runs small, so consider choosing a size up from your normal size. The Ladies shirt colors may appear differently on your computer monitor. In person, the yellow color is a nice light yellow (even though it may look khaki on screen). The color called “black” is actually a deep charcoal gray. As Vanessa’s health now rapidly declines, we feel an urgency around spreading this message that is so dear to her. 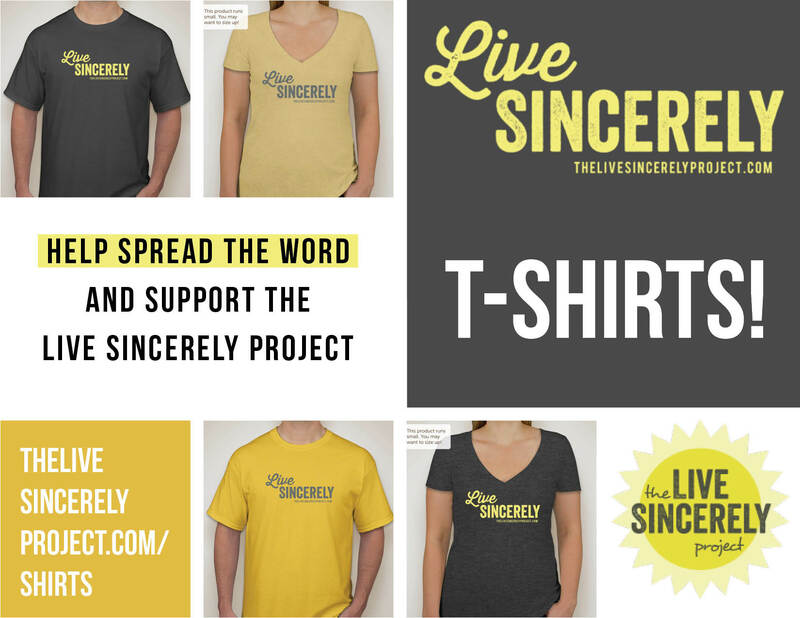 Over the last year we’ve gotten a lot of requests for t-shirts, and we decided to use this as an opportunity both to spread the word and to help support the ongoing costs of The Live Sincerely Project. Even as the cancer has continued to affect her personality and cognitive abilities, Vanessa did not lose her drive to share generously the Live Sincerely message. She gave everyone she saw one of our Live Sincerely pins or magnets: doctors, nurses, waitresses, the grocery deli counter guy… anyone willing to listen, she would tell to live in an authentic way, with purpose and with love. Your t-shirt purchase will help us continue to make and purchase the items that we give out to spread our message. We will also use funds raised to help pay for the hosting and other website costs for TheLiveSincerelyProject.com, which has allowed us to share our experiences and updates on Vanessa. We want to reach as many people as possible with the invitation to Live Sincerely — so wear your shirts everywhere, too! :) THANK YOU for your help.